Not afraid of god, I am afraid of man. Hello Habbo Widget Stalker! Nice to meet you and I hope you enjoy stalking me as much as I enjoy stalking you! Most trusted only. Invite only. All holders of this badge are Special Guest of SIO and have access to the main headquarters, they must be respected and show respect at all times. A member of the Democratic People's Republic of Korea. This badge is for those who have made a impact on the agency world of habbo and are Experienced & Influentual, these Vetearns should be given respect for their hard work and are considered 'Legends'. The whole industry been in shambles, everybody fugazi, im just changin' the channel, Kendrick Lamar, the people's champion, im animal for aπalyst, career damaging verses, meditating when candles lit. olowe07 is our Lord and Saviour, StarShu is our great Pope. Please check that you have the correct badge. All FBI members are expected to join the AGENT badge. OOA is a collection of the most senior and experienced members of Diceplaya's Group Of Companies. Collectively they have the real power to change things. There Directive is simple, the upkeep of the Group of Companies. Please verify this rank using the official SWAT forums. Pos. created by Diceplaya. Members may verify. This group has people who are helping me design a project. Use the forum to discuss design ideas. From the rough to graded then cut and finally polished, Diamonds are made from the very thing that sustains the very dynamic which gives them value. We wear eyepatches! (Request if you wear eyepatches for the same reason I wear my eyepatches.) Requirements: You believe in Freedom and wear an eyepatch in habbo. If a poor man cannot give then he will never be rich. It will be understood by those on the top floor. If the King cannot be ruled then he can never learn to rule. Let it go, can't hold it back anymore. Turn away and slam the door. I don't care what they are going to say, Let the storm rage on. The cold never bothered me anyway. To be alive is certainly not to live. Luck is not based on the ethics or morals of Utilitarianism or Libertarianism. It is the concept that success or failure is apparently brought by chance rather than through one's own actions. Who knows if this coin brings Success or Faliure, or Neither. Whales, thats why they're lame. One man can change everything for himself because he can control what he sees. But one man cannot change everything for everyone because he cannot control what they see. Even if you believe in power you simply believe in an explanation of Human behavior. It is possible that man can loose any power he might have to the desire to seek it or enact it. Harder they rise, harder they fall. Crumble like the Berlin Wall. We are all ready to protect Freedom. I'm giving up on you. And I will swallow my pride, you're the one I love and I'm saying goodbye. If you are searching the lines for a point you probably missed it. There was never a point in the first place. If our hands are cold so must our touch. Very select group of people who are selected due to their ultimate loyalty to universalisation and take part in actions that further this goal on Habbo.com. The Siê Council isn't a Habbo exclusive idea and the members devote their lives to the cause. It would only be possible to achieve time travel if we could reverse the ultimate barrier, death. For time travel is not the reanimation of the dead. If you cannot understand the limit of your own sanity you will never understand the truth. These people can enter Russian Forces Formal Conference room. You must be a member to the Russian Forces official group and be active in order to be accepted and use this room. An Original Founder of the EPF. The only one left on habbo.com. Members within this badge served within EPF in a high capacity between 2009 and 2012. Badge members possess equal promotional rights as members who hold the Owner badge. These people give advice to olowe07 on Habbo related political matters. Very Important people: These have earned the right to sit in the most prestigious area in the school. Deserve the upmost respect while in the room. Established by the Chairman of the E-HUN, Successfull. This is an organization that is a united group of experienced individuals of different corps. 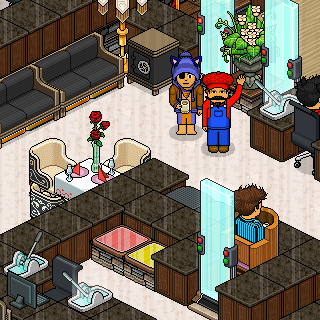 that come together to make joint choices for best interests in Habbo, and events for the community. Japanese restaurant and tea house. After understanding, life then death comes the universal of all three. TBD / Pending. Please do not ask questions. The Miserere Theater is a concept art created on Habbo.com by olowe07 which projects the vision of a theater that captures every moment in a play of his creation named "Miserere." The embodiment of sadness and misery. It is, what is says. Yes I know it's spelt wrong. 888 - A compass of thought. The last ruler and Emperor of China. Taken in this room on 24 December 2017 and received 0 likes. Taken in this room on 25 July 2017 and received 0 likes. Taken in this room on 23 July 2017 and received 4 likes. Taken in this room on 14 February 2016 and received 1 likes. Taken in this room on 15 November 2015 and received 0 likes. Taken in this room on 1 November 2015 and received 2 likes. Taken in this room on 16 August 2015 and received 0 likes. Taken in this room on 11 July 2015 and received 0 likes. Taken in this room on 6 July 2015 and received 0 likes. Taken in this room on 3 July 2015 and received 1 likes.